Welcome to All Kinds Of Blinds. Our name pretty much says it all. 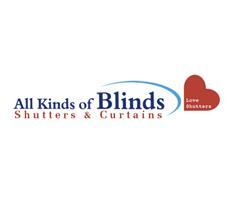 We have years of experience within the blind, shutter and curtain industry serving Essex, London and the home counties. We have a first class reputation and a portfolio of highly satisfied customers. We are a family run business and have been established since 1999. All Kinds of Blinds offer a complete service, from manufacturing, measuring to final fitting. We believe that there is no substitute for a personal, individual service and offer a home or office consultation for customers who cannot make it to one of our showrooms. Even weekend and evening appointments can be made. We are the perfect one-stop option, whether you're looking for Roman Blinds, Venetian Blinds, Pleated, Roller, Woodweave or Panel Blinds, Vertical Blinds, Awnings or Shutters. Select the look that suits your vision - warm natural woods, sleek aluminium or bold luxurious fabrics. We offer real hard wood shutters at MDF prices! Made to measure shutters and blinds for the home and office.